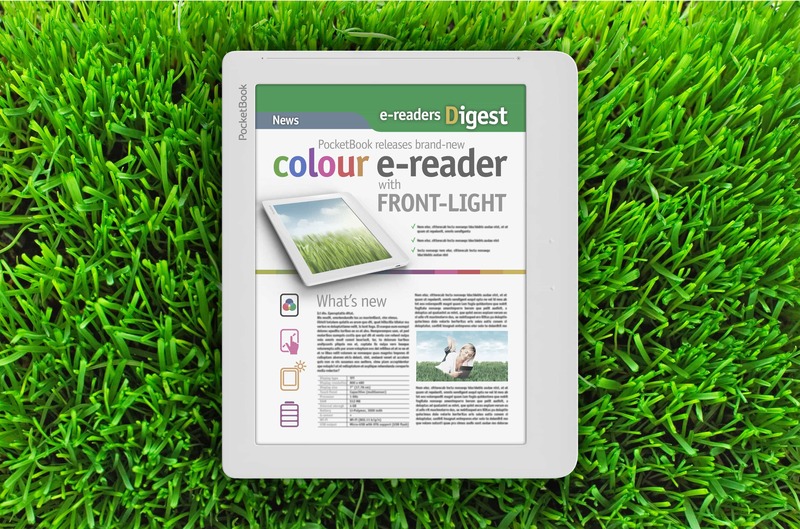 Remember that frontlit color ereader which E-ink showed off at IFA Berlin? It's turned up again, this time in the hands of Pocketbook. Kiev-based ereader manufacturer Pocketbook has just announced that they plan to make the world's only ereader with a lighted color E-ink screen. The new new ereader will have an 8" screen with a resolution of 800x600, a capacitive touchscreen, and Wifi. It's not clear yet what the rest of the specs are, but this ereader will likely have a card slot, internal storage, and I'm betting it will also have Bluetooth. There's no price mentioned in today's announcement, but Pocketbook has said that the new ereader, which I am calling the Pocketbook Color, is going to hit the market in June 2013. This ereader is based on a slightly newer version of the Triton E-ink screen. It can display up to 4096 colors at a resolution of 800x600, which is a slightly higher density than previous color E-ink screens. Actually, right now I don't know if that last figure is the resolution for color or for grayscale, though I expect that it is the color resolution. As you might know, E-ink screens get the red, blue, and green colors not from the pixels in the screen but from a filter laying on top of the screen. One colored pixel actually requires 4 pixels in the E-ink screen, one each for red, green, blue, and white/black. So a color E-ink screen with a resolution of 800x600 is actually lying on top of a grayscale screen with a resolution of 1600x1200. The resolution gets cut in half twice thanks to the need for the color pixels. In any case, I'm hoping this ereader will have more success than the last ereader with a color E-ink screen. The Jetbook Color ended up much delayed, under-equipped, and overpriced. As a textbook platform I found it a poor alternative to the iPad or pretty much any Android tablet. Card slot or not, any school that buys this over an iPad Mini should be brought up on charges of child abuse and possibly kickbacks too. Apple fanboys are very funny. This is much better for reading books than any iPad. You will get a vastly improved battery life, and you can use it at the school with plenty of direct natural light. Correct. That was supposed to include a mention of the frontlight but I guess I left it out. I fixed it. Thanks! I wonder how the frontlighting will affect the image quality. The color E-ink screen contains both the grayscale layer (the normal E-ink screen) + a layer with RGB filters (W is a transparent or no filter). IMO this screen will look just as awful as the current unlit displays you find a jetbook. The frontlight is only beneficial in low-light conditions. I am looking forward to this. 8 inches is an excellent size for reading (I have an 8.2-in Android tablet, love it), and color is nice for children’s books, etc. Unfortunately, to sell any significant numbers this needs to be cheap (around $200), but it won’t be. I predict that it will be priced at $350 or so, and remain a niche device. We’ll have to wait for Amazon/B&N/Kobo to start selling affordable color e-readers, as they have the economies of scale and the ebook income allowing them to price aggressively. But since they are currently busy pushing their greyscale front-lit HD screens, this won’t be for another 12-18 months, in my opinion. They had the Mirasol color readers from Asia which has better color and refresh rate than eink but never made it to USA. E-ink color only needs to be fast enough for web browsing like the High Speed Ink System that Cybook employs on their Odyssey ereader. I’ll wait for Samsung Liquavista reader. I wonder how long would the battery last if u do a lot of web browsing, let alone play animation or flash. “Better color than E-ink” is at best a misleading detail because E-ink never went for color. Their big push was on the bistable nature of the display and the lower power demands which it engendered. And you’re wrong about a color E-ink screen being good enough. I have days or weeks of battery life on most of my tablets and they all have decent color LCD screens. Any screen which cannot match that should just stay home. Besides that lcd screens are terrible in direct sunlight. I have no idea what you are saying here about the LCD displays in your tablets lasting days or weeks. I don’t think that any of them have a battery life rated for longer than 20 hours…10 hours is probably more realistic. I’m so excited about the evolution of colour e-ink. I will be converting much of my library of books with colour pages 🙂 Just waiting for it to get good enough and cost effective enough.